IT has been a long winter and here in Utah it isn’t over yet. It snowed eight inches yesterday. I occasionally paint in the winter but didn't this year, preferring to stay in the studio painting with a hot mug of chocolate nearby. But spring will be here eventually and that means it’s time to organize our field kits, grab our french easels, and start painting in the field. Painting from photos is a great advantage but in the absence of painting from life your interpretation of nature can become impoverished. Painting shadows too dark is a common error of painting from photographs as is painting highlights devoid of color. Even in high and low values the natural world maintains saturated colors. Which is impossible to replicate with the limited value range of pigments. The wide value range that maintain their color intensity in nature is one of my biggest problems when painting outdoors. I tend to match values but because of the inability of paint to capture the high and low values and still preserve saturation I lose color in the high and low value areas of my painting. This year I intend to consciously focus on forcing my value range more toward middle values, sacrificing an accurate value range in favor of a richer range of colors. In the field I may have relied too heavily on my value scale, but value is only one aspect of a painting. When I painted en plein air my lights would look washed out and my darks like black holes punched in the canvas. My values were accurate but I lost the sense of luminosity. The remedy is to observe accurate value, record where the important value zones are, but then compress the values to allow more color in those areas. For example the lights should be in the 6 to 7 range and the darks in the 2 to 3 values. That leaves values 4 and 5 for the middle range. In other words to paint effectively outside you must consciously compress your value range to give the illusion of saturated color. Does that mean the 9 value finder is of no importance in the field? Not at all. It will give you accurate measurements you can then decide how to manipulate on your canvas. 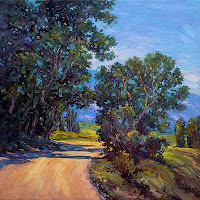 The reason plein air painting is so difficult is the need for subtle value shifts, and the necessity of using illusion to maintain saturation. It can be hard to differentiate one zone from the next and still maintain the necessary pattern. If you lose this pattern you lose your overall design and the painting becomes indecipherable. One way to preserve these subtle shifts in to be sure to maintain hard edges and to keep value patches discrete. If edges become too soft or blurred the value zones will no longer fulfill their compositional function. Nature is the ultimate teacher for the landscape painter and the time is at hand to resume our eduction. This seems to be a problem that many past artists have faced too. I like your thoughts on compressing the value range to keep things saturated. It's all relative anyway right? Things can appear brighter or darker depending on what is next to them - a way to leverage a smaller value range. Yes, everything is relative and field effects and contrast gives us the opportunity to represent the natural world with very few values. I suppose we could think of it as a very complex optical illusion.